These are the best shots yet of the new KTM 1290 Super Duke GT model – which is just months away from being officially revealed. The new bike will sit above the KTM 1290 Super Duke R in the range as a more practical and longer-range bike. 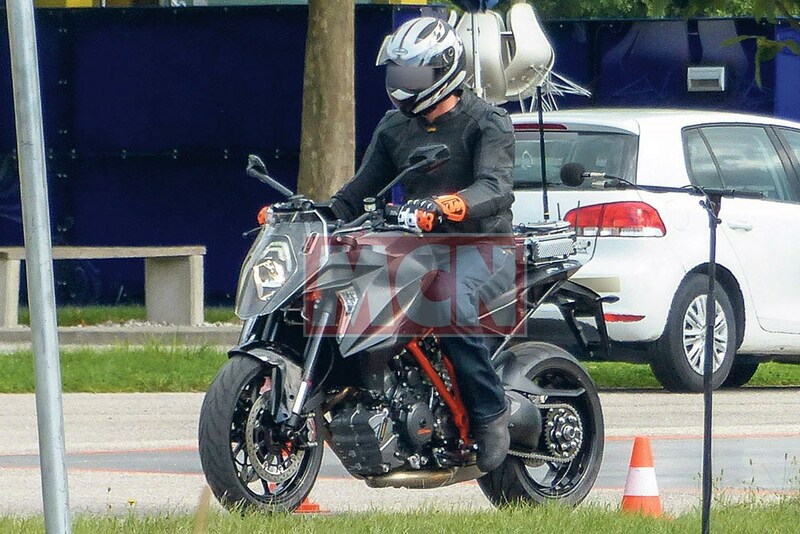 We can see for the first time how much extra work has gone into modifying this version over the existing naked Super Duke R, as this test bike is wearing little in the way of disguise. As far as we can make out the black-painted bike (far right) is only missing the large windscreen we believe the production bike will wear as standard. Earlier and much rougher prototype bikes have been previously spotted with large windscreens covered in disguise tape. A second bike (main image) can be seen with a large screen fitted, giving a clearer idea of what the bike will look like in production trim. 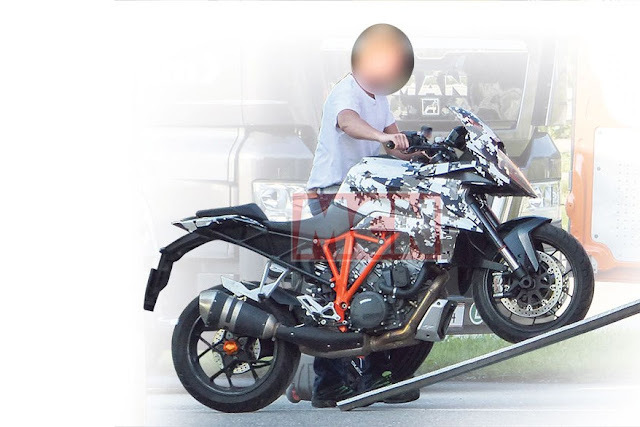 KTM refuse to releasing any information about the GT at the moment, but MCN understands the finished bike will be unveiled at the Milan Motorcycle Show in late November as part of the official launch of the new 2016 KTM model range. The new 1290 Super Duke GT is, in many ways, the spiritual descendant of the old KTM 990 SMT. The SMT was a popular bike in the UK thanks to the combination of its powerful V-twin motor and reasonable practicality thanks to the windscreen, luggage and extra comfort for both the rider and the pillion. The market has changed significantly since the 990 SMT was launched in 2009 and this new GT model should bridge the gap between the bonkers 1290 Super Duke R super-naked street bike, and the globe-busting 1290 Super Adventure. This new bike has clearly involved some comprehensive engineering work to make the 1290 Super Duke R’s underpinnings more suitable for long-distance riding. 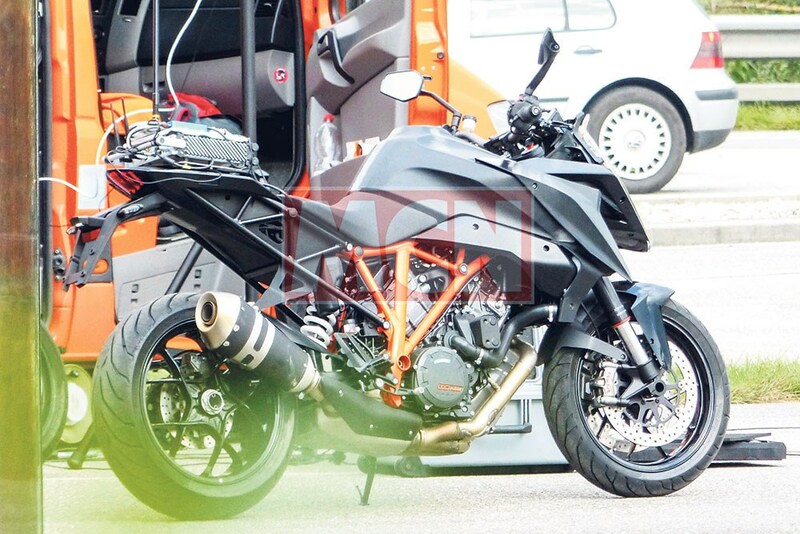 It’s clear to see there is a heavily-revised and much more substantial steel trellis subframe, designed to support the extra load of hard luggage and a pillion with far greater ease than the Super Duke R.
The GT’s bodywork is also significantly different to the R, and it’s believed the fuel tank nestling behind its big flanks will also be much larger, giving it an increased range. The GT’s tank should hold more than its naked sibling’s 18-litre capacity, but it’s doubtful that it will be stretched out to the 1290 Super Adventure’s massive 30-litre tank. Somewhere around 22 litres seems likely. Smaller detail changes include the fitment of Pirelli Angel GT sports-touring tyres, a new design of front light with LED running lights, and the side-mounted three-stage LED cornering lights first seen on the flagship Super Adventure. These cornering lights are linked to the bike’s lean-angle sensor and illuminate as the bike leans over (more lean equals more lights), flooding light into the apex of the corner. The past few years have seen frantic new bike development work by KTM in order to expand their range from 125cc single-cylinder bikes through to the largest 1301cc machines. The company has rapidly expanded their Research and Development department, recruited heavily and invested huge amounts of money in an Indian manufacturing tie-up with Bajaj to build bikes in India. MCN spy photographers have also recently scooped a parallel-twin 800cc roadster, which will lead to a new middleweight range of bikes in 2017. MCN also recently tested a prototype of a new 690 Duke, which we expect to be launched alongside this new Super Duke GT at the Milan show.